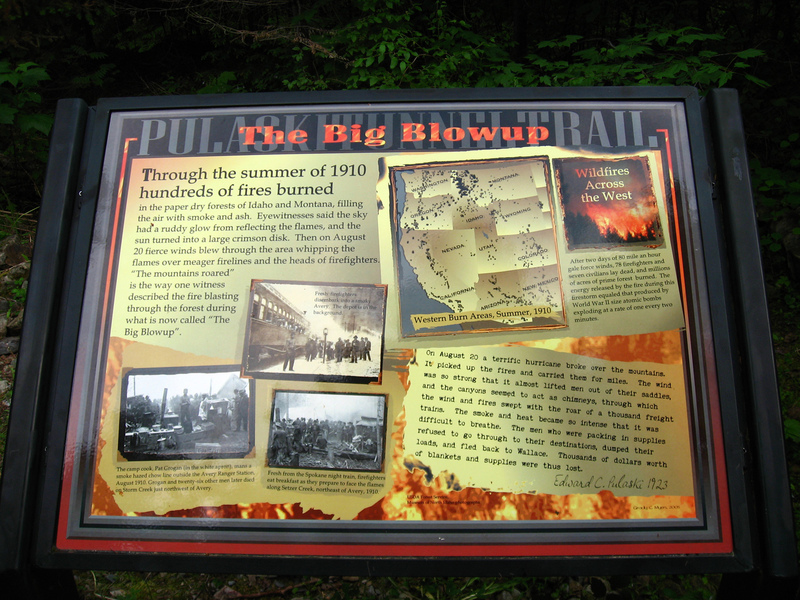 This weekend marks the 101st anniversary of the “Big Blowup,” when 3 million acres of forestland went up in flames during the 1910 fires. In July of this year, I finally made the hike to Pulaski Tunnel outside of Wallace, Idaho, something I’d wanted to do for some time. 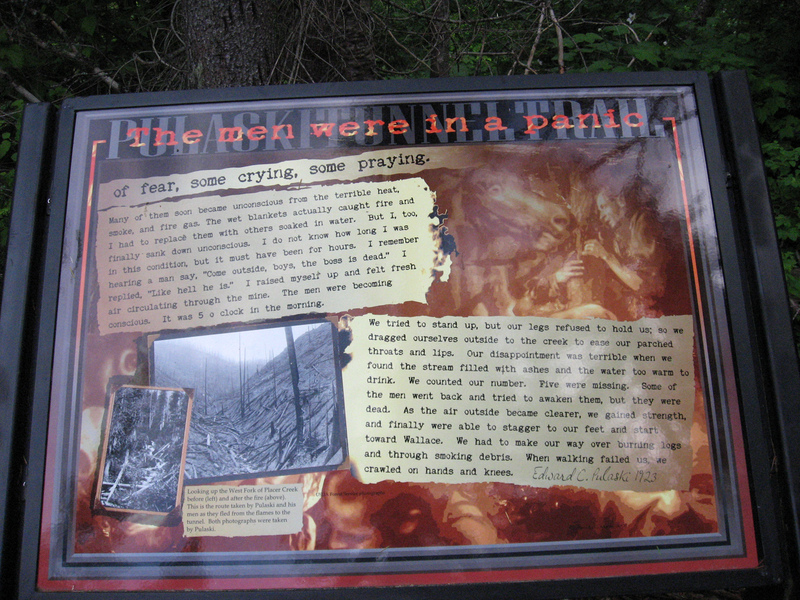 The tunnel is where Ed Pulaski forced his fire crew at gunpoint and ordered them into the small tunnel as the inferno raged around them (you can read his firsthand account in this article). 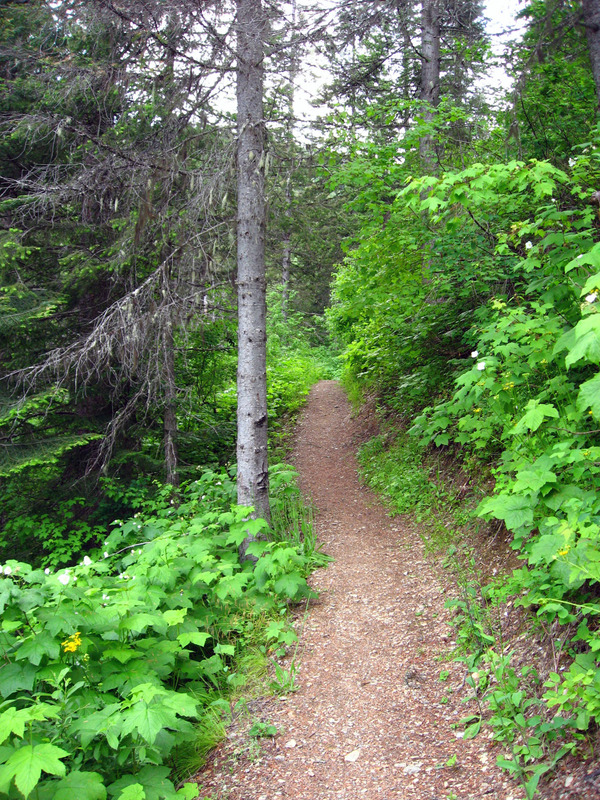 Because Wallace is not easy to get to, I thought I’d offer a virtual hike. 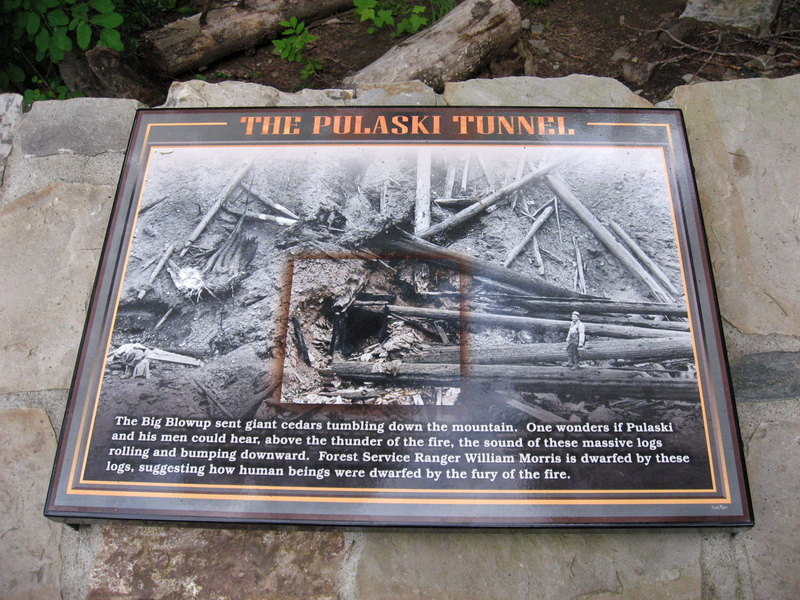 The trail was built by the Pulaski Project. 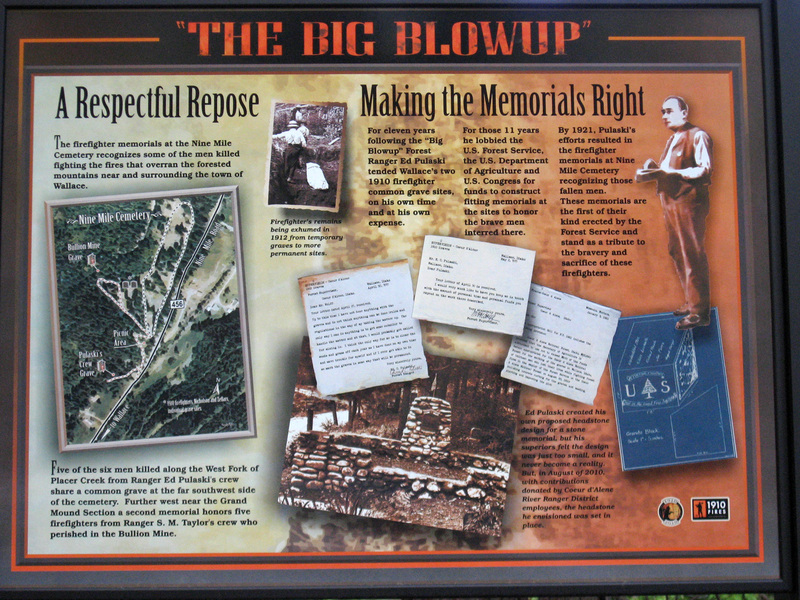 The project was a substantial undertaking; researchers and archeologists had to first determine where the tunnel was; then came construction of the trail and installation of the signs in rugged country. 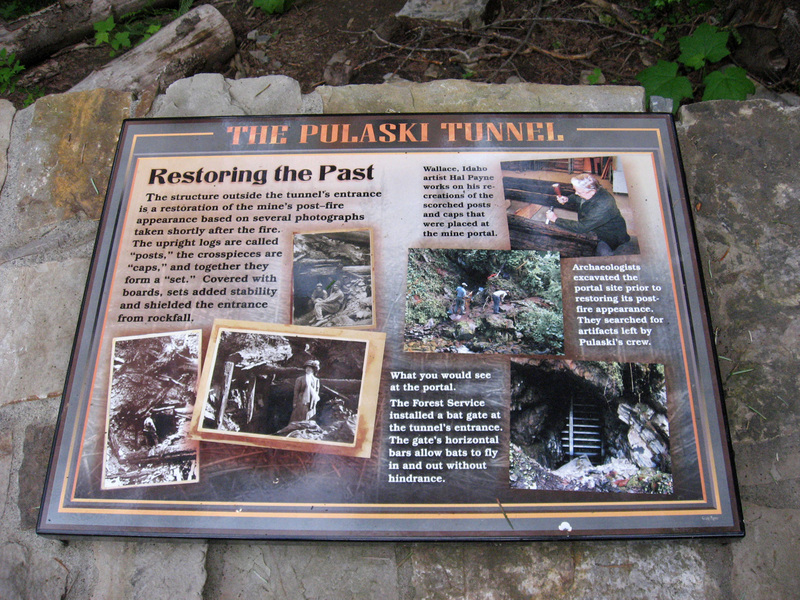 Many thanks go to all of those who worked on the Pulaski Project. The first few hundred yards are paved but then it’s compacted dirt the rest of the way. It’s a beautiful if slightly challenging hike because of the elevation change. 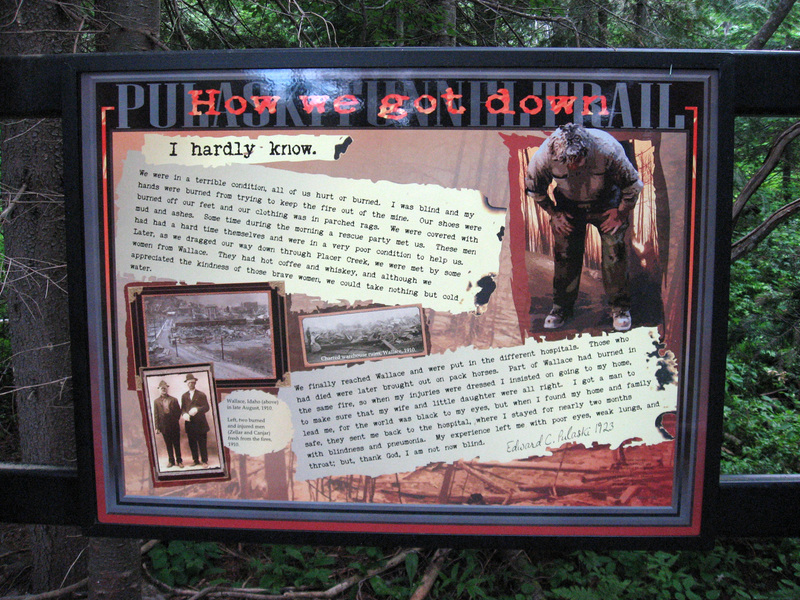 This the first sign along the trail. 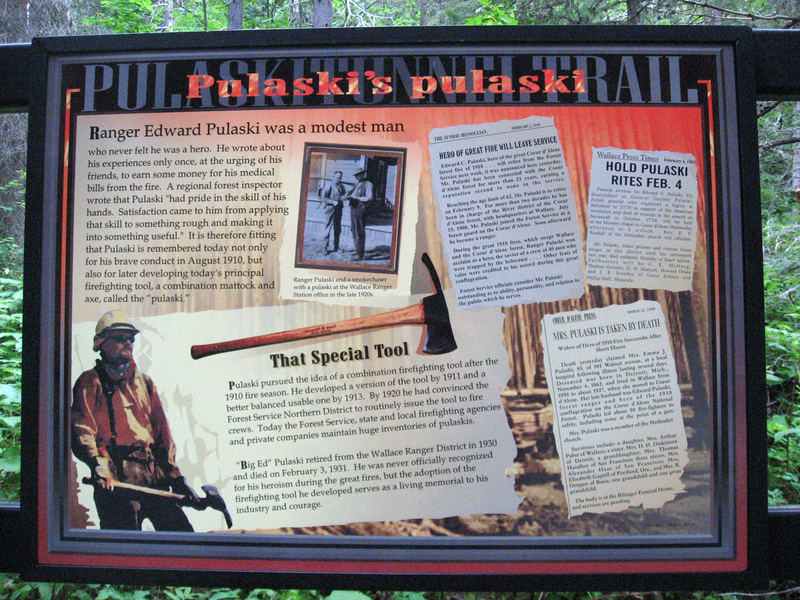 The trailhead is marked by posts with Pulaski tools on them. To read the text on any of the signs, please click on the photo. 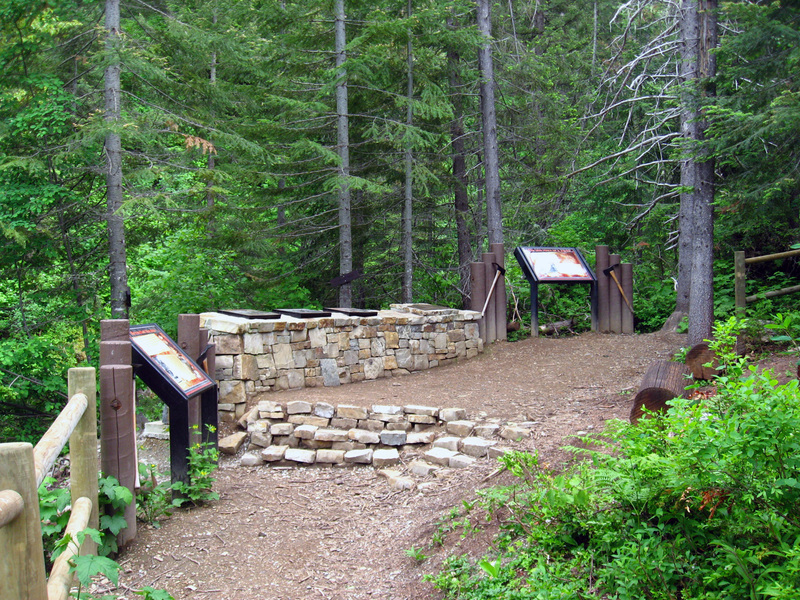 The trail runs along and above Placer Creek. You’ve only started. There’s lots more to see after the jump. 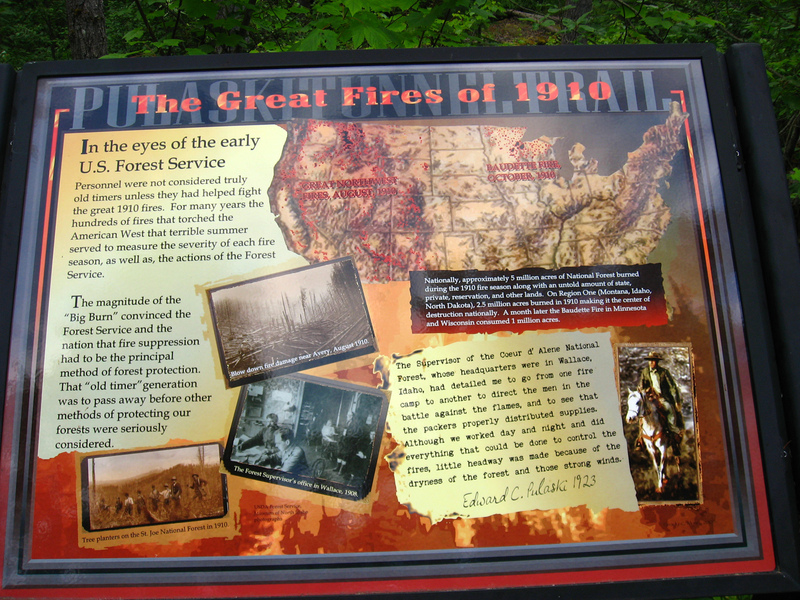 You’re not on the trail very long before you see a reminder of what happened in 1910. 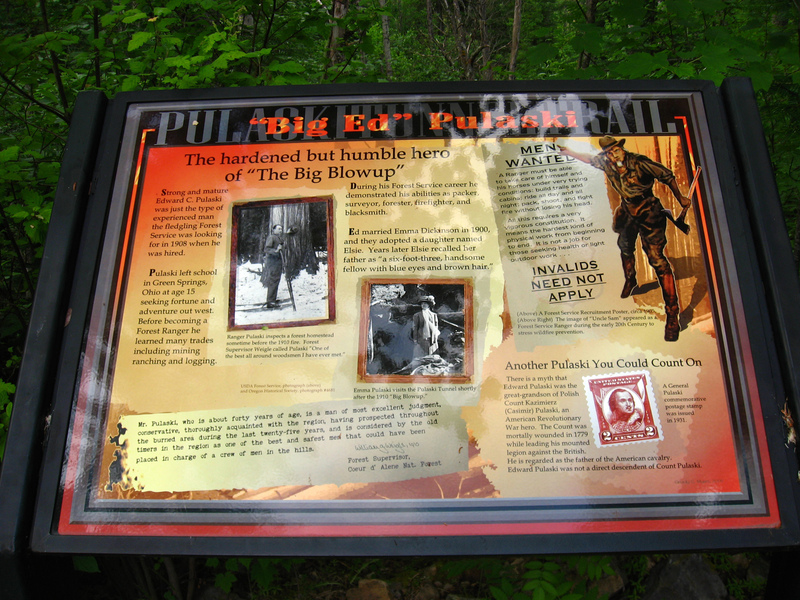 This sign dispels the myth that Ed Pulaski was a direct descendent of an American Revolution hero. When you see his obituary later, you’ll notice that that’s the first thing they noted about him. 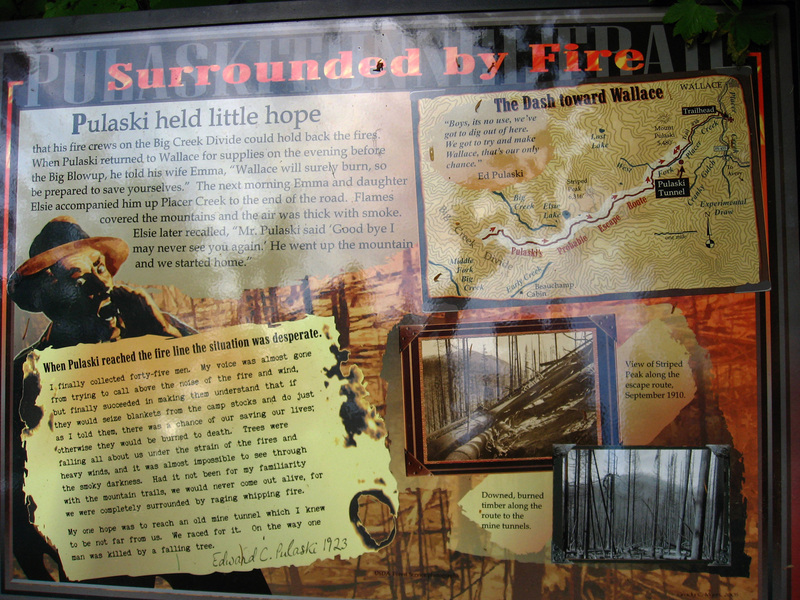 The Big Burn wasn’t the only fire going on that summer. There were fires throughout the U.S. all year long. 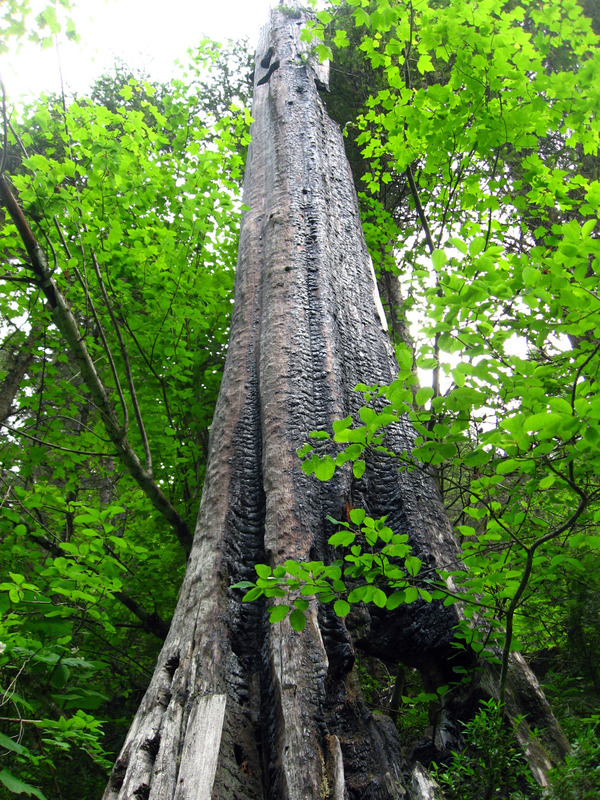 This cedar snag is a remnant of the 1910 fire. 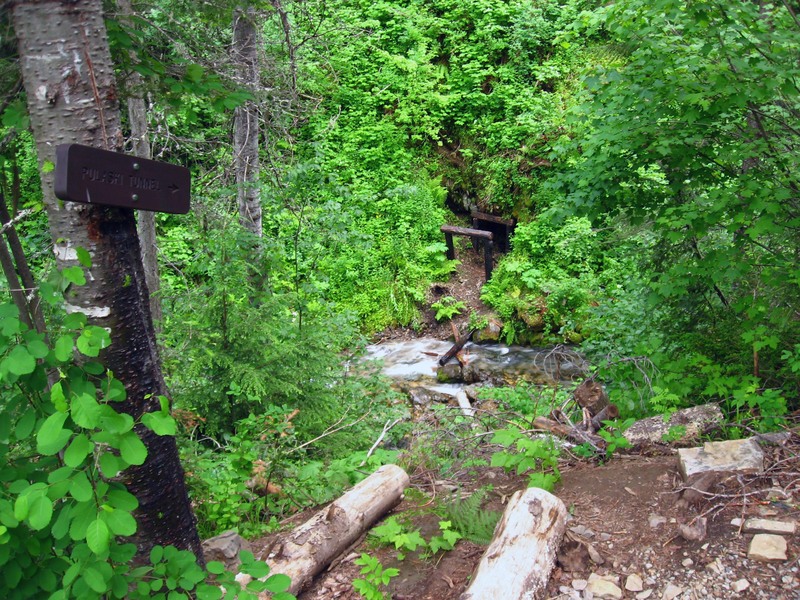 It’s marked with a sign and is right along the trail. The map shows the extent to which the smoke and debris affected the atmosphere over much of the U.S.
For much of the trail, there are no signs to read, no signs of what happened. Just the sounds of the murmuring creek and of insects and birds. After 2 miles, you get to a loop that overlooks the tunnel itself. 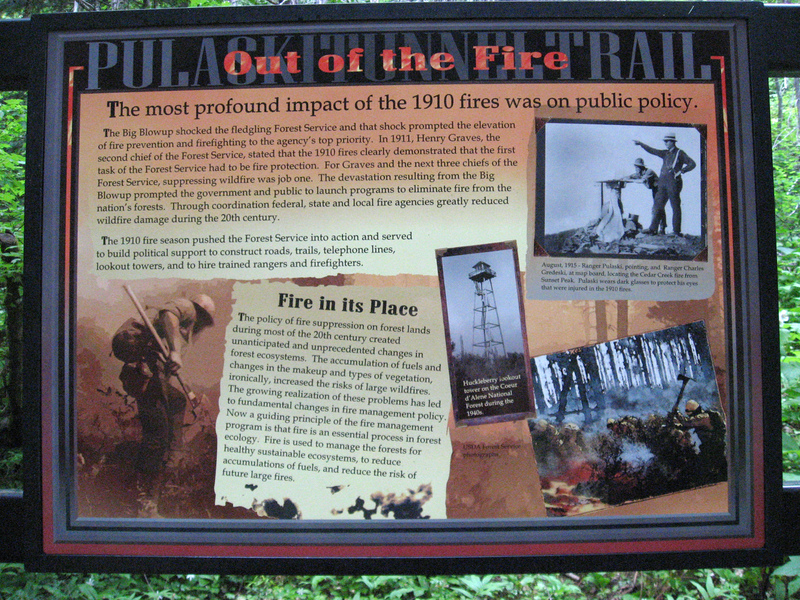 The signs here tell more about what happened as well as the work involved in restoring the site and a discussion of fire policy history. 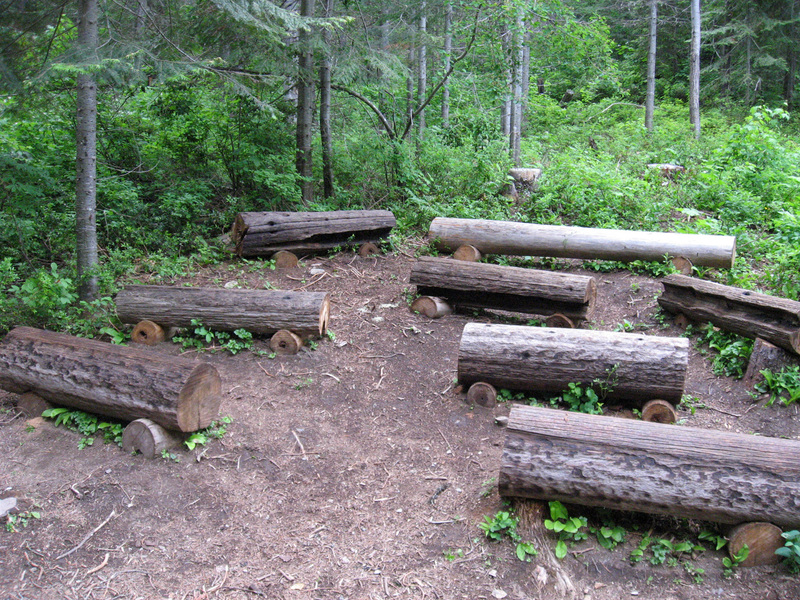 There’s also a place for folks to sit and gather if they’re on a group hike or tour. It’s needed after the long walk uphill. Hope you brought enough snacks and water for everybody. 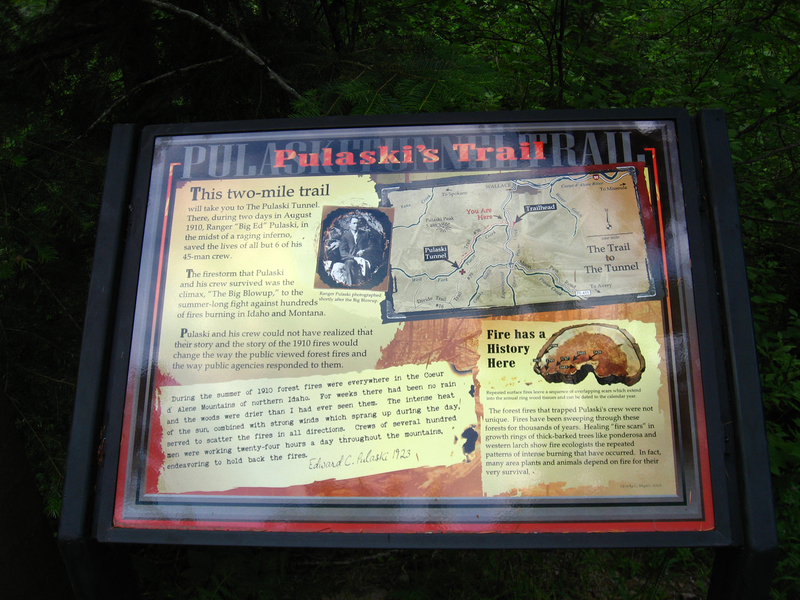 The use of Pulaski’s letters on the signs help bring the story to life. 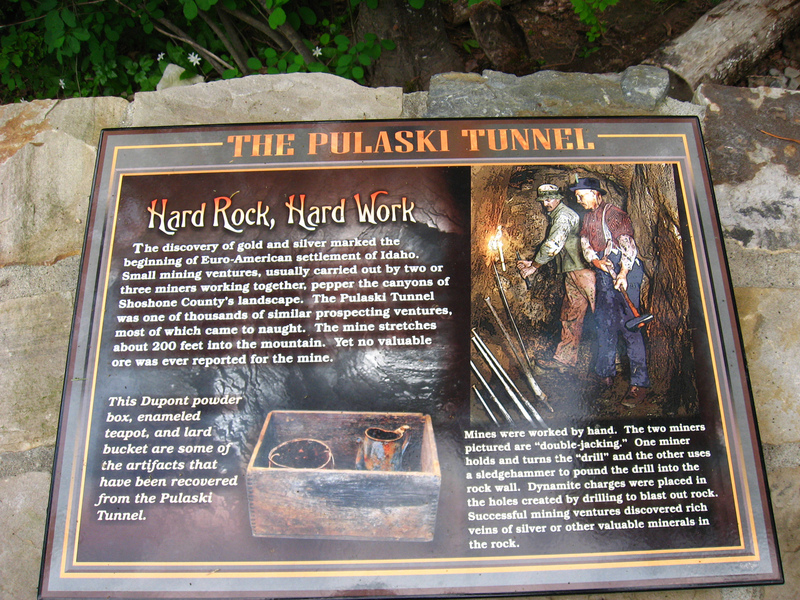 Pulaski knew of the tunnel because he’d worked as a miner in the area. This photo was taken about a month after the fire. 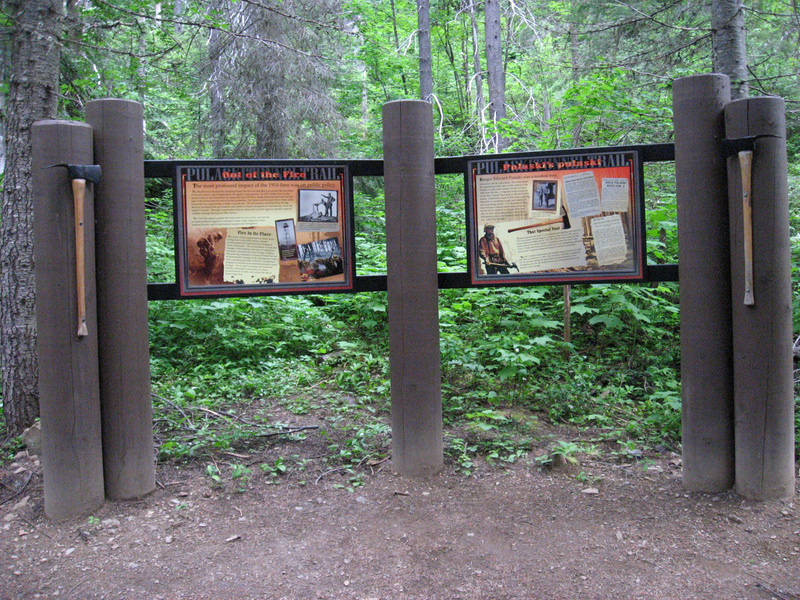 This blog post has a photo of the posts mentioned in the sign just before they were installed last summer. Also note the photo of the tunnel opening on the sign. From the stone wall, you can see the tunnel opening from the high embankment. 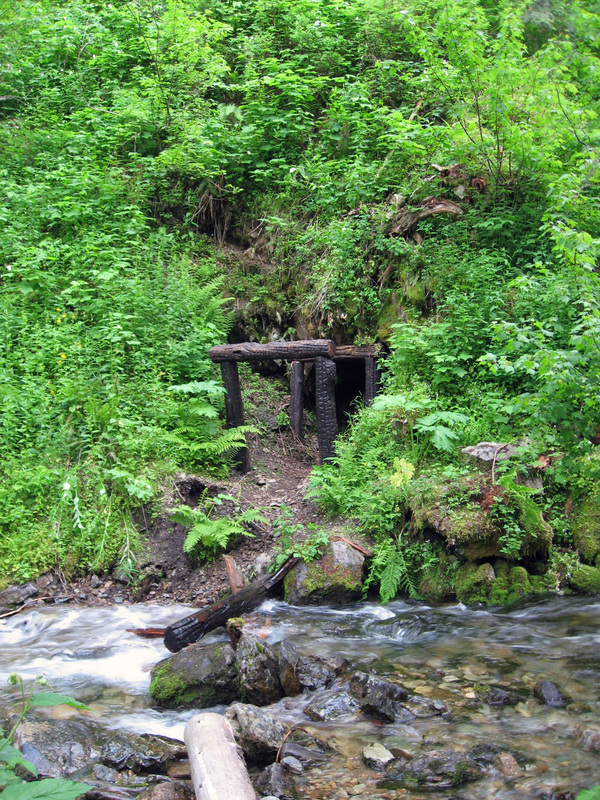 It’s not advisable (nor is it easy) to climb down there. The opening is about 6 feet tall and 4 feet wide at its widest. Once I saw the size of the opening, I understood why Pulaski tried to hang wet blankets over the opening to block the smoke. 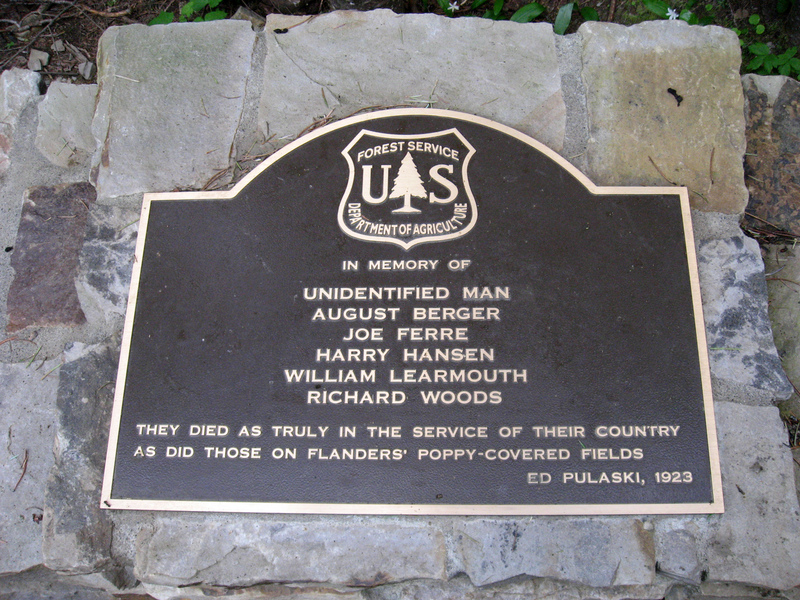 This is one of three memorial markers in the Wallace area commemorating the dead firefighters. 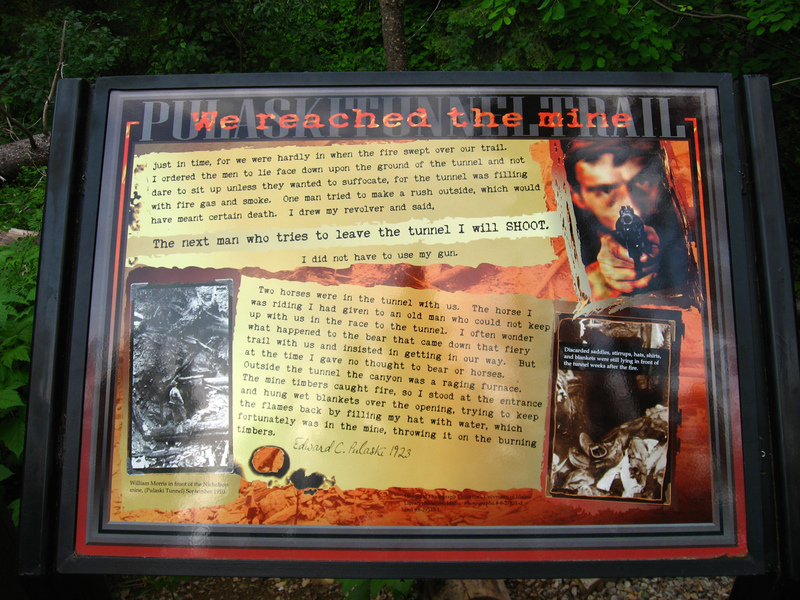 This one is at the tunnel overlook. 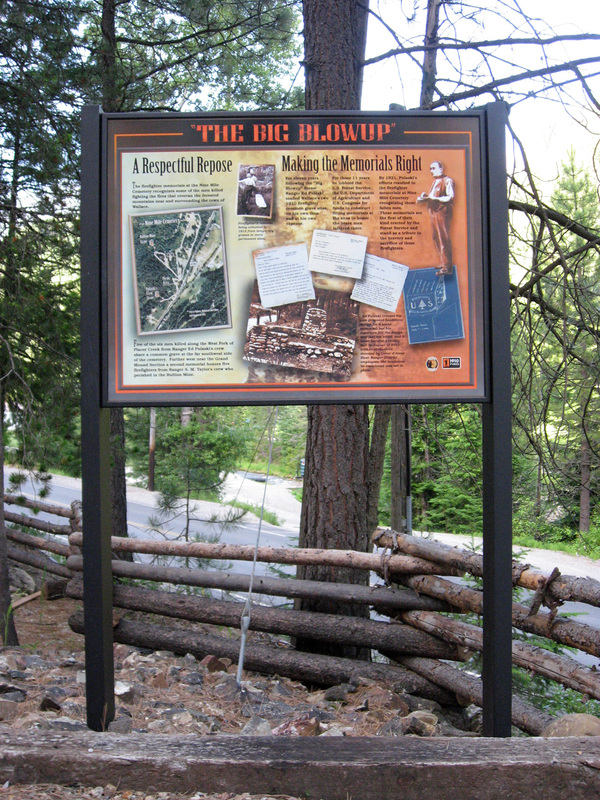 The story of the markers is told on the first sign at the trailhead. Ed Pulaski’s story quickly made him a legend. In case you were wondering, some of the photos used in the signs are recreations. The one at lower left is not. Sometimes Pulaski is incorrectly identified as one of the men in it. As you come around the loop to the main trail, you’ll see these two signs. Note the Pulaski tools on either side. Close-ups of the signs are below. 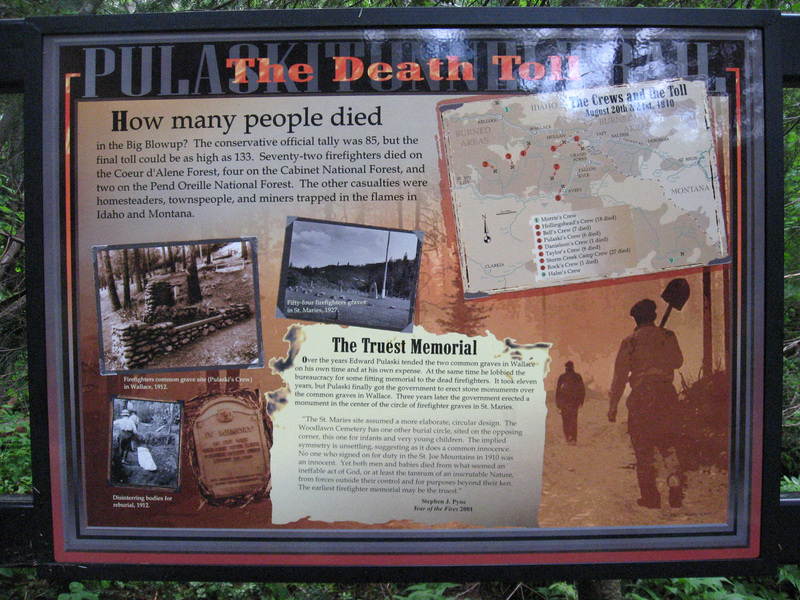 What the sign doesn’t tell you about Pulaski is that the Forest Service never paid any of his medical expenses or reimbursed him for all the work he did on memorial for the dead crewmen in town, nor did he make (or want to make) money off of the tool that bears his name. 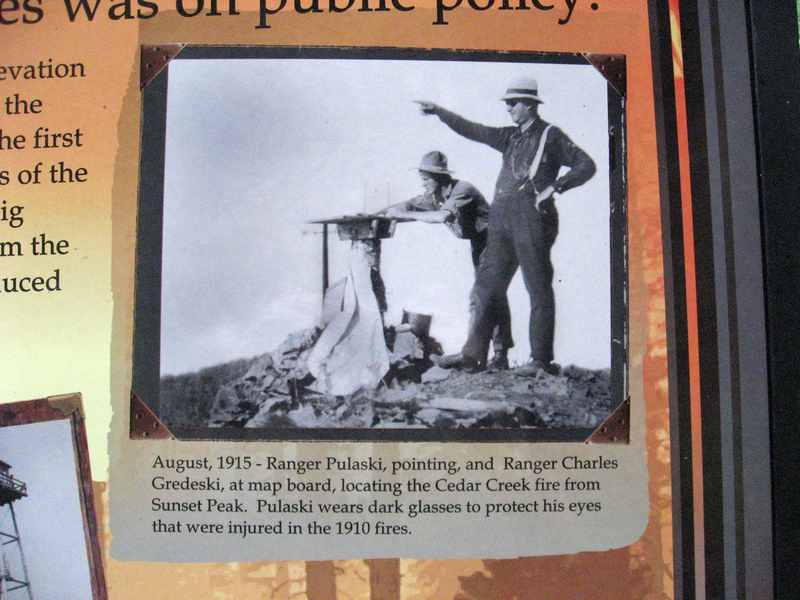 Ed Pulaski’s injuries from the fire plagued him the rest of his life. 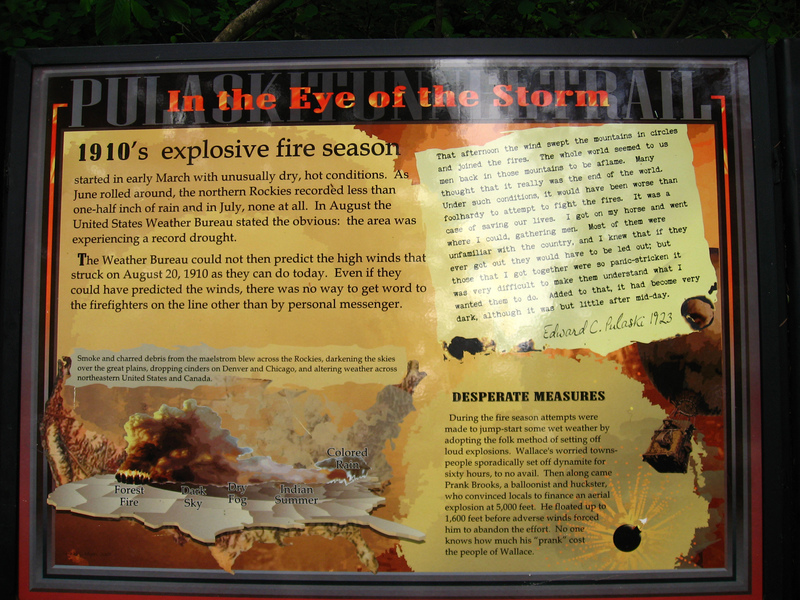 This sign does a good job of summarizing 100 years of the evolution of federal fire policy. 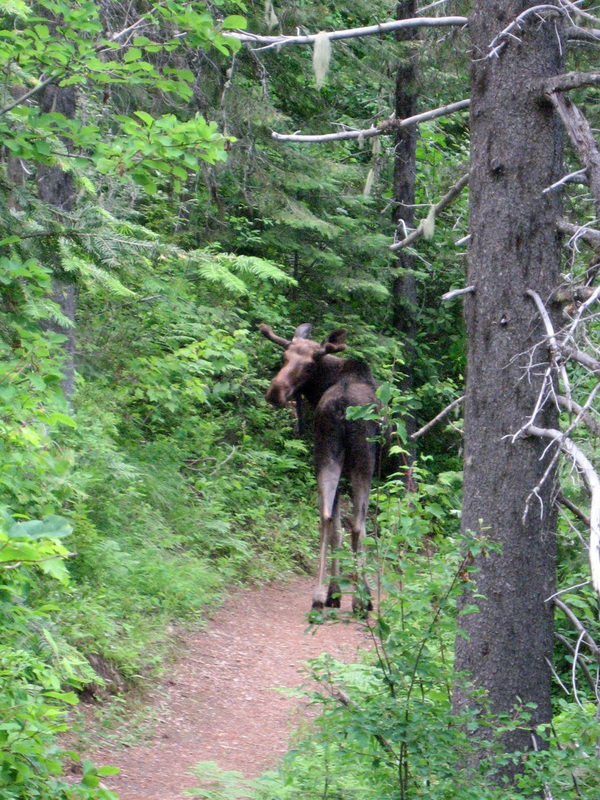 When I came around the loop and onto the main trail, I spotted Bullwinkle on his evening stroll. He doesn’t look pleased to find me on his trail. 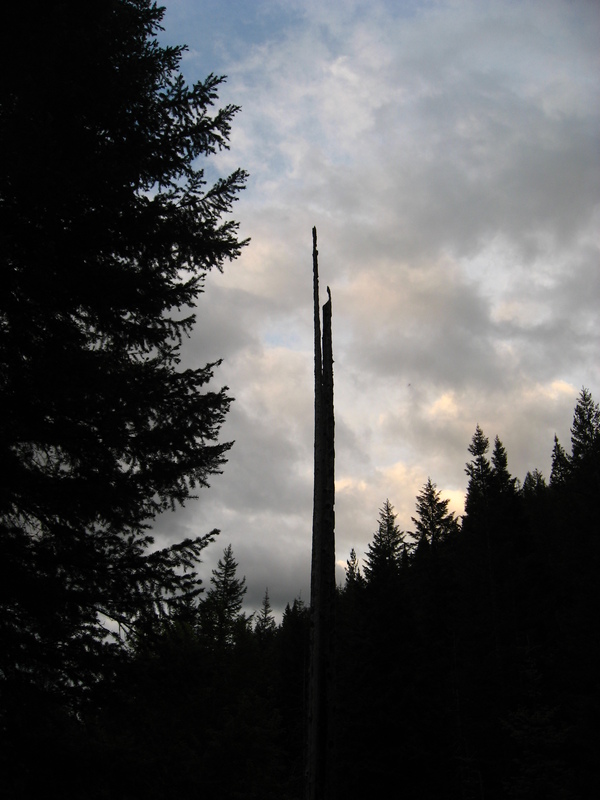 A lone sentinel stands watch over the trail.